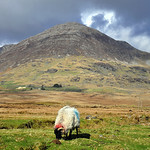 The gardens of Connemara are well-known for their beauty, variety and uniqueness. Rain, soft sunshine and the warmth of the Gulf Stream combine to make ideal conditions for the creation of magnificent and magical gardens. The general landscape varies greatly throughout the region from the stone walled farmlands to the rolling hills and fresh waters of Lough Corrib to the wild mountains and valleys. Within this landscape lie garden treasures that have been laid out by a variety of local people. The coastal location means that plants are adapted to a moist maritime climate, but the Gulf Stream ensures that the region does not suffer from the extremes of temperature experienced by many other countries on the same latitude. However, the Atlantic setting can also cause problems; salt and storm can be a challenge to every plant and tree. The soil is acidic and shallow in most places and much needed nutrients must be added to make it fertile. This creates a challenging environment for gardeners, but they ensure that the flora and fauna follow the weather patterns of the region. Hydrangeas, Rhododendrons, and Heather are common features in gardens in the West of Ireland as are azaleas and camellias – and even the odd palm tree! 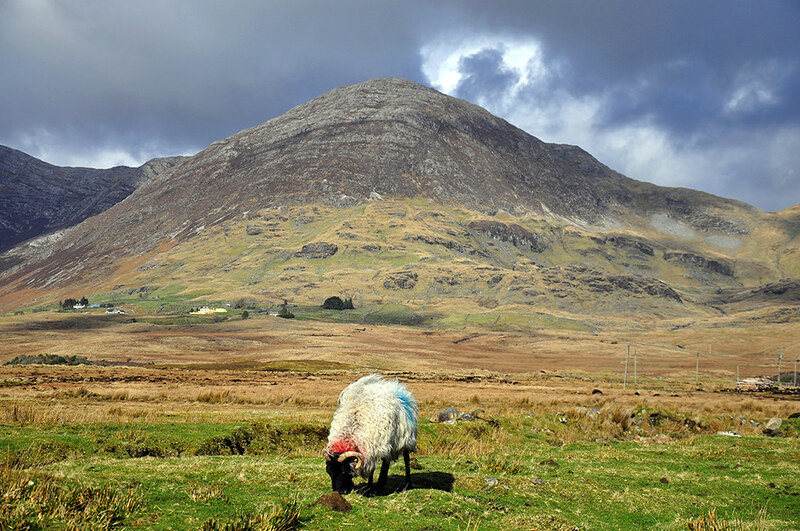 The gardens of Connemara range in size and style, from formal to wild. Many feature exotic plants which were imported at the turn of the twentieth century and others have concentrated on the discovery and preservation of gardens which are over 300 years old. As well as visiting some of the major gardens of the region, why not take time to discover some of the smaller gardens of Connemara by visiting the garden of a private home. Meet the owners of these hidden gems who lovingly tend their gardens year round. Every garden featured in this garden trail has its own story which we hope you will explore and enjoy. Nestled at the foot of Derradda Hill, overlooking the Ballynahinch River, this 19th century private garden rambles over rocky outcrops and through centurian trees. Best during April and May to walk in the scented Azaleas, Apple blossom, Daffodil and Bluebell wood. Cost: Voluntary contribution towards arts and music in Connemara. Lorna McMahon‟s renowned private garden is cut out of the surrounding hazelwood and spans 5 acres. Winding paths review a unique series of gardens filled with interesting plants and alive with the sound of water. Lorna specialises in growing Primulas, Poppies and Hostas. 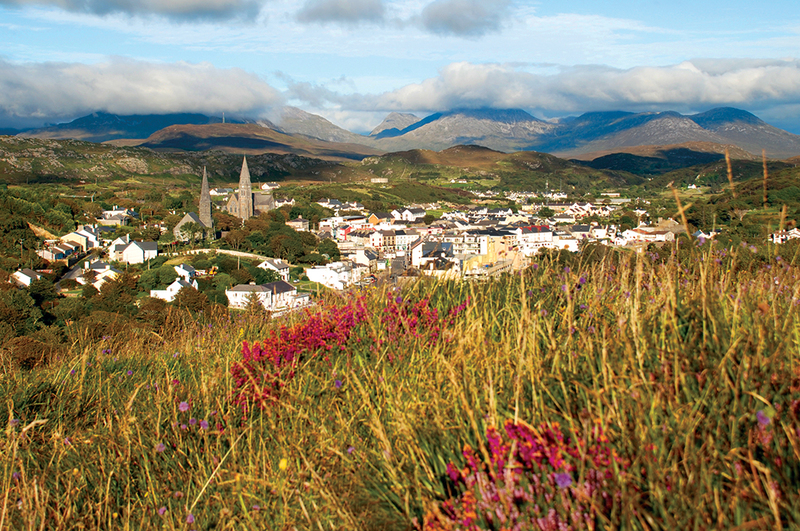 Directions: Take the N59 road to Clifden from Galway city. After about 5 kms, take the second turn on the left after Glenlo Abbey Hotel. The turn is marked Oranswell. and is before you reach Tobermore Paving on the right hand side. Open: May to September by appointment only. There are also 3 Open Days on the last 3 Sundays in May from 2-6 pm. Cost: €5 in aid of Galway Mental Health Association. Ballynahinch Castle is the perfect example of Victorian gardening. Here the meeting of wild woodland and waterways with herbaceous borders, terraced beds and lawns creates a unique blend of refined gardening and natural beauty. The estate has undertaken a native woodland management program which has seen the removal of invasive rhododendrons and the planting of over 1000 hard wood trees. This program continues and now nurtures hundreds of native oaks from their own plants. They are also participating in a study with Trinity College Dublin, on the effects of climate change on Irish hardwoods. This is a long-term project that will span the next 30 years. The 450 acre estate features riverside and lakeside walks in gardens on many levels and set out among the mature trees and shrubs. A walking map is available from the hotel reception. Unique Celtic-themed gardens offer a magical experience for all ages, blending Irish mythology with contemporary design. Relax in the basket swings and sit on the ancient throne, explore the nature trail, stone chamber and crannóg. The gardens are family-friendly with a kids‟ discovery trail and natural play area. There is an excellent Café and gift shop too. Check out the website for the lively programme of special events and for group tours. Directions: 20 minutes drive from Galway on N59 to Clifden, well sign-posted from the N59 between Moycullen and Oughterard. Cost: €5.50 – €7.50 adult; €4.50 – €5.50 senior / student / unemployed / disabled; €3.50 – €4.50 child; children under 4 years FREE; Family from €17.00 – €22.00. Standing at the head of Cashel Bay is a mid century gracious country house owned and run by the McEvilly family as a Grade A hotel. The gardens are informal country house style gardens based on a number of woodland glades. The garden contains a profusion of roses both old fashioned and modern and many herbaceous plants with naturalized day lillies, astilbes and primulas as well as gunnera, camelias, magnolias, azaleas, and rhododendrons. The walled garden (now known as the secret garden) was an orchard where in 1919 Jack O’Mara felled apple trees and used the walled garden as an area in which to plant many rare trees and shrubs which he collected from all over the world. Many of these trees are the largest specimens in Ireland. Cashel House also runs gardening courses throughout the year of 1-3 days in duration. A map of the gardens is available at reception. Directions: South off the N59 Clifden/Galway road. 2 kms west of Recess. Richard Duke de Stacpoole‟s 3 acre rambling and rocky heather garden has many hidden borders which includes Pampas grasses with two varieties of bamboo. With many different varieties of shrubs and rare plants, these gardens present themselves as a magnificent collaboration of colour and beauty. The gardens also contain natural pools as well as a series of unique statues and sculptures created by contemporary Irish artists. Directions: Take the R341 Clifden/Roundstone Road. Continue on the main road through Ballyconneely. 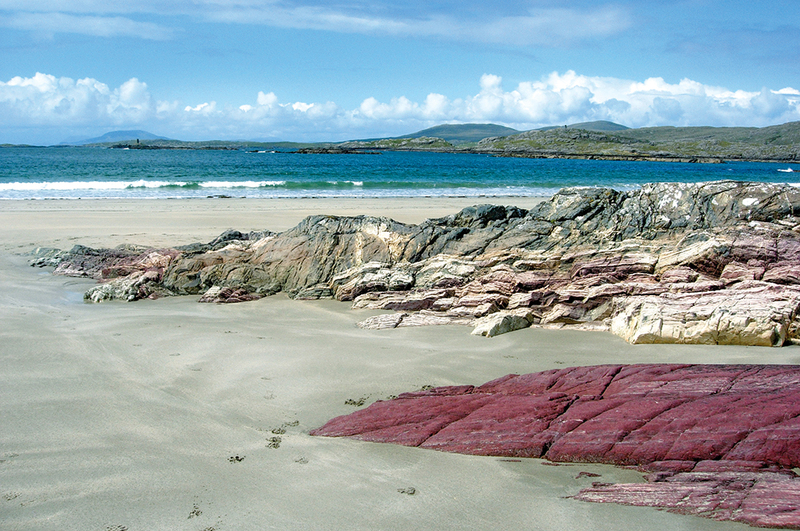 Just before you reach the town of Roundstone, take the road on the left signposted for Errisbeg House. Errislannan Manor is an AIRE approved Riding Centre with beautiful gardens on site. The gardens have been lovingly tended by the Brooks family since 1957. There is a Daffodil Wood, a Bluebell Wood and a Sycamore & Comfrey Wood. Camelias and Rhodos come out in February followed by Apple and Cherry Blossom, Azaleas, Magnolias and the glorious Flame Tree. There are specimen trees such the Gingko, Handkerchief and Judas, not forgetting the monkey puzzles within the estate. A walled garden with herbaceous border and roses can also be seen. Open: Easter until October, Monday – Saturday 9 am – 5 pm. Ask for a map in the stable office. Directions: Take the R341 Clifden to Roundstone Road. Take the second major road to the right signposted „Alcock and Brown Monument‟. Continue for 3 kms passing a church on the left. Look out for the signs for Errislannan Riding Centre on the right. Cost: €5 towards maintenance of the local church, the most westerly in Europe. Breandán O‟Scannaill‟s early 19th century garden contains an unusual collection of trees and shrubs. The garden is a wildlife sanctuary and no chemicals are used within the garden. Wildflowers and exotics blend in this very personal place with sea views around every corner. 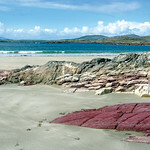 Directions: 1.5 kms from Clifden town on the Beach Road. Set against the backdrop of the Connemara mountains, the six-acre Victorian walled garden at Kylemore was created by Mitchell Henry in tandem with the building of Kylemore Castle in 1867. The castle is now known as “Kylemore Abbey” and is home to Ireland‟s only Benedictine order of nuns who have restored and cared for the Kylemore estate since 1920. Uniquely, only Victorian varieties of flowers and vegetables are grown in the walled garden which contains two distinct areas: the kitchen garden and the flower garden. Visitors are welcome to explore the walled garden, see bananas and grapes grow in the glass houses just as they did in the 1800s, wander through the wild garden, and discover the many lakeshore and woodland walks. Winner of the Europa Nostra Award. Open: 7 days a week, all year round. Directions: From Galway take the N59 Clifden road, just past Recess turn right onto the R344 and follow signs for the abbey. 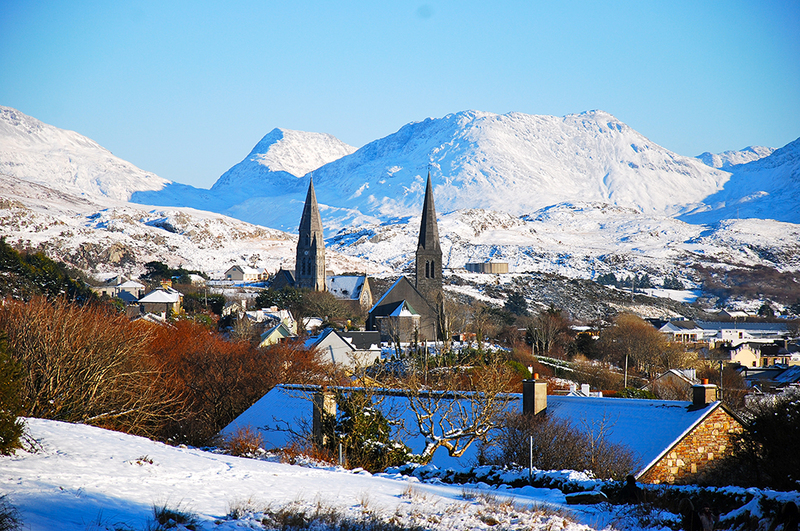 From Clifden, take the Westport road. Kylemore is 5 kms after Letterfrack village. Cost €12.50 adult; €10.00 senior; €8.50 student; accompanied children under 10 years of age FREE; Family: from € 25.00 – € 33.50; Groups of 10 or more € 8.00 per person. The gardens of Renvyle House Hotel are situated on the edge of the Atlantic Ocean within an estate of almost 200 acres which includes a lake, woodland and farmland. The house itself is the former home of famed writer and surgeon Oliver St. John Gogarty and the gardens have been lovingly restored. Herbs from the herb garden are used daily by the chef and numerous woodland walks are carpeted with bluebells in early summer. There is an orchard and a rose garden and more formal gardens thrive around the croquet lawn. The aromatic plants here were chosen to withstand the Atlantic wind and salt and are predominantly in blue and white to echo the colours of the sea. Directions: From Galway on the N59 Clifden road, just past Recess turn right onto the R344 and follow signs for Kylemore Abbey. 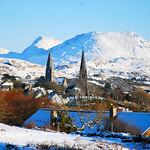 After passing Kylemore Abbey on the right, continue on to Letterfrack. Turn right at the crossroads in Letterfrack village. After 7 kms, follow the signs for Renvyle House Hotel.